What Happens when the Patient Stops Fighting Cancer? On December 23, 1971, President Richard Nixon declared "war on cancer", signing the National Cancer Act into law. This law significantly strengthened the National Cancer Institute, giving it more autonomy within the NIH and more funding. 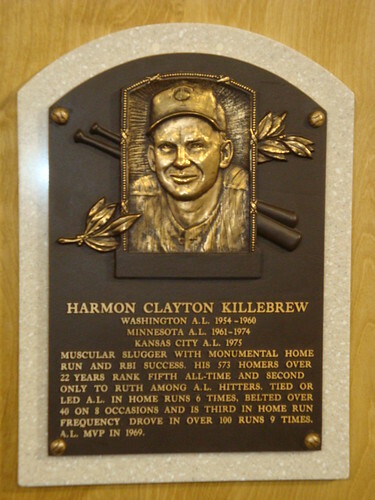 Earlier in 1971, baseball Hall of Famer Harmon Killebrew (nicknamed "The Killer" for his slugging prowess) finished his 18th season in the major leagues. That year, he won the Lou Gehrig Memorial Award which is given to players who emulate Gehrig's character both on and off the field. At the age of 35 and 36, Killebrew still produced excellent statistics playing for the Minnesota Twins in 1971 and 1972 before his production fell off in the years before his retirement in 1975. "It is with profound sadness that I share with you that my continued battle with esophageal cancer is coming to an end. With the continued love and support of my wife, Nita, I have exhausted all options with respect to controlling this awful disease. My illness has progressed beyond my doctors' expectation of cure. I have spent the past decade of my life promoting hospice care and educating people on its benefits. I am very comfortable taking this next step and experiencing the compassionate care that hospice provides. I am comforted by the fact that I am surrounded by my family and friends. I thank you for the outpouring of concern, prayers and encouragement that you have shown me. I look forward to spending my final days in comfort and peace with Nita by my side." Like many who practice palliative care or work with hospice, I'm ambivalent at best about the idea of using war as a metaphor for treatment of a life-limiting illness. The anti-cancer therapies do work in a war-like manner, with chemotherapy and radiation being given in an attempt to annihilate cancer cells. But what happens when those treatments don't work or aren't even possible in the first place? If you lose a battle, is it because you are personally weak, just "gave up," or met a superior enemy? Any of the three is explanations is a potential set-up for feelings of shame which then can complicate grief and social relationships once the "battle is lost." But even if you do buy the war metaphor, isn't there so much more to "fighting" a disease than annihilating it? For what are we "battling"? To conquer far away lands? (Which metaphorically represents extra time alive that a patient may wish for, but isn't guaranteed.) What about just preserving the integrity of the soil on which we stand in spite of the advancing enemy! In other words, aren't attempts to preserve quality of life/psychological well-being in the face of worsening cancer an important part of the strategic battle? Of course. In that sense, the "battle" never ends. As a matter of fact, Killebrew does refer to the "continued battle." Stopping disease-modifying therapies is a big deal for patients and families, and when a famous person announces this in the press, it's the most surefire sign that the death of the person has shifted from merely "possible" to "expected." Even when the shift from curative/remissive therapies to palliative-only therapies takes place gradually over time, the gradual shift is (almost?) always unbeknown to the public (who may know that the person is "battling" the cancer, often with the celebrity's reassurance that there's a chance they might "win" the battle.) So when a hospice referral is announced, it often seems abrupt. This subtly perpetuates the myth that it's "either curative or palliative." The metaphors and the mindsets go hand in hand, and one won't change without the other. So what I wish for Mr. Killebrew is many more home runs before he hangs up his jersey.